In April 2014, I had an extra $500 in my pocket thanks to an app called LiveToWin. That same nifty little app just netted me another $500 in a little over a month, simply through a post on my blog. I shared the details of the app on my website, along with a referral code. 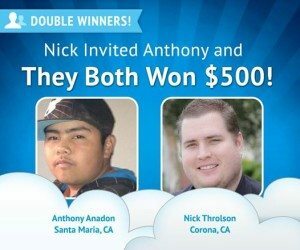 One of my readers entered the code and we each won $500 as a result. I?ve always had very good luck with contests, but the LiveToWin app increases my chances substantially. There are thousands of prizes being given away every day, but finding reputable contests that actually deliver on their claims has been a real problem. Not anymore. ?LiveToWin notifies users when they win and the app?s preferences can be set to let them know when new prizes are available and how to earn extra entries. It provides users with the drawing date, a prize description, prize options, methods of delivery and the estimated time of arrival should they win. It offers users a convenient way to keep track of each item they?ve won. Prizes run the gamut, from gift cards and money to electronics. Contestants have the option of choosing how their monetary prizes will be delivered ? via check or PayPal. In some instances, prize winners can choose whether they want to receive the physical prize or a cash equivalent. No purchase is necessary to win and a prize winner is guaranteed every day. a specific service. A spin-the-wheel game allows users to earn extra entries. The LiveToWin app is available at the iTunes store and can be downloaded for free. It?s compatible with the iPhone, iPad and iPad Touch. It?s available for Android operating systems on Google Play. So far, I?ve won an iPad, $100 and $500 twice, along with a lot of gift cards. Sweepstakes scams have made many wary of contest apps, but LiveToWin has made me a winner on numerous occasions. No one has to deprive themselves of fun and the nicer things in life through a missed opportunity. The highest value for prizes and amounts top out at $500, but it?s not just the monetary value of the prize that counts. Winning makes people feel special, even if it?s a $10 gift card. In this economy, no one can afford to turn down free products or money. Besides, contests are fun and the time investment is very small. How many entries on each of the times youve won did you have? Hi I had around 5,000 to 10,000 entries I honestly was pretty lucky when I won wish you the best of luck via the app Livetowin.